Reena Ahluwalia was invited by the Gemmological Association of Great Britain (Gem-A) to speak on 'Diamond Storytelling Through Design & Art'. A topic Reena has spoken extensively about. Reena highlighted need for diamond industry to tell diamond stories that can authentically connect to next generations and their aspirations. Diamonds already start as nature's art-forms. One thing we have learnt in the diamond and jewellery business is that each generation brings their own challenges and opportunities. Collectively as an industry we must have the vision to not only seek to understand the Millennials, but also the generation that will exert their market power after them. According to Reena, trends may come and go, but stories are truly cross-generational. Stories never go out of fashion. Stories, live on. Established in 1908, the Gemmological Association of Great Britain, or Gem-A, is the world’s longest established provider of gem and jewellery education. Read Reena's speaker's interview for Gem-A. 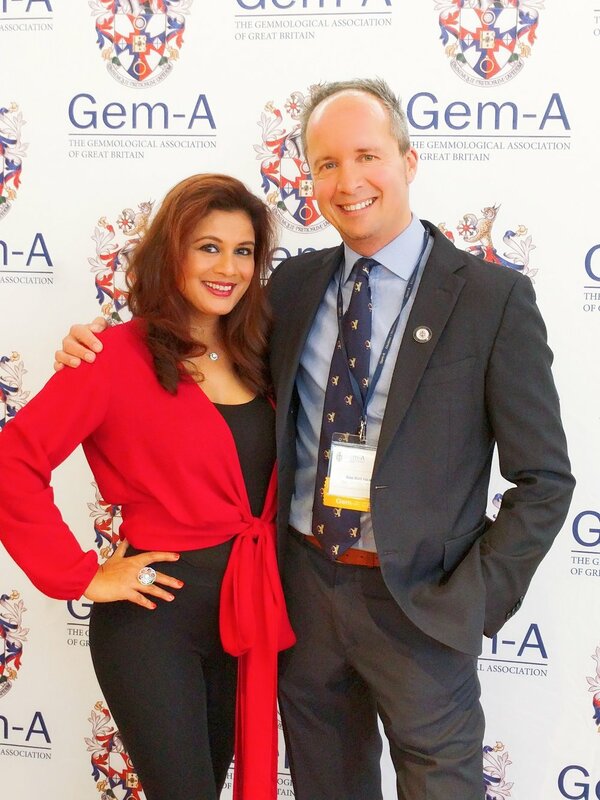 Reena Ahluwalia with Gem-A CEO, Alan Hart. Reena Ahluwalia showing the Coronet By Reena spinning diamonds collection to attendees at the Gem-A conference. Image: Henry Mesa, Gem-A. Wonderful Mark Cullinan of Cullinan Diamonds (his great grandfather was the owner of the famous Cullinan Mike), is now the owner of Reena Ahluwalia's blue diamond painting. Beauty of a pure heart shines brighter than any star! Nothing can stop us to radiate our inner brilliance. A pure heart is pure light! It's that essence I set out to capture in my painting. After all, what is heart without story? 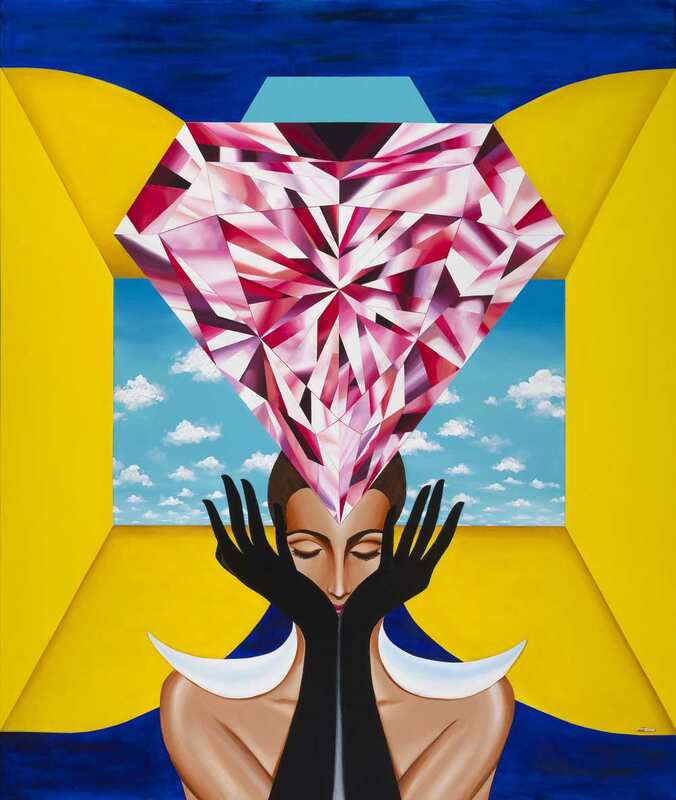 From the 'Diamond Portrait Series', this painting is a portrait of 'Pure Heart'. A D-flawless white heart-shaped diamond full of light and brilliance. The most romantic of all diamonds, heart-shaped diamonds are often referred to as an extremely popular fancy cut and the ultimate representation of love. I love working with heart-shaped diamonds for my jewelry creations. So much so that I have written about the most Famous Heart-Shaped Diamonds. Here are a few images of the painting and process! Enjoy...! Life is an eternal quest. Yet, not all those who wander are lost. Our journeys are journeys of seekers and wanderers, a journey inwards. In quest of our being, of clarity and truth. I explore this notion in my work here. "The Portal of Quest" painting is from the 'Diamond Portal Series", one that I am currently working on. In the Diamond Portal Series, I explore the moments of human emotions as seen through the lens of the diamond as a storyteller. You are invited to enter portals where subtle references exist but the story is completed based on your life experiences and desires. I hope that each time you see the work, a new set of questions, solutions and possibilities emerge. The qualities of diamond act as metaphors and hold the stories together. Here are a few images, enjoy! Detail. Close up of the heart-shaped diamond. I hope to share more of my artwork soon, please stay tuned! If you are interested in acquiring or commissioning an original Reena Ahluwalia painting, please contact us.